It’s getting easier for borrowers to get an FHA-backed home loan . Major lenders will now approve FHA mortgage applications for borrowers with FICO scores of 580 in the Tampa Bay area. It marks a 60-point improvement from last year, when FHA lenders required 640 FICO scores or better to get approved. The news comes at a time when FHA loans are in demand. The program’s 3.5% down payment minimum is among the most lenient for today’s home buyers; and underwriting requirements on an FHA loan are flexible and forgiving. FHA mortgage loans account for close to one-quarter of all loans closed today and is only easier to get with the drop in minimum credit score requirement. FHA loans are an important component of the U.S. housing and mortgage market. FHA loans are loans, which are insured by the Federal Housing Administration and made available to U.S. buyers and existing homeowners. The FHA was formed in 1934 and it exists to provide affordable housing to Americans. Today, it’s the largest insurer of mortgage loans worldwide. The Federal Housing Administration doesn’t actually make loans. Rather, it insures loans made by the nation’s banks, providing protection against default and loss. In order to gain the FHA’s protection, lenders must only make sure that the loan in question meets the lending standards as set forth by the FHA. The FHA’s rulebook is known as the “FHA guidelines” and it describes all allowable loan traits, as well as the going terms of an Federal Housing Administration-backed loan. For example, FHA guidelines state that homebuyers must make a minimum down payment of 3.5 percent against a home’s purchase price; and that buyers can be cleared to buy a home 12 months after a bankruptcy, short sale, or foreclosure. Guidelines also place limits on the size of an FHA-backed loan, which varies by county. FHA loan limits range from $271,200 for a single-family home to $1,202,925 for a 4-unit home in the state of Florida. FHA mortgage guidelines define which loans the Federal Housing Administration will, and will not, insure. However, U.S. lenders don’t underwrite loans to the FHA guidelines as they’re written, to the letter. Lenders impose additional restrictions known as investor overlays, which make it harder for an applicant to qualified for an FHA-backed loan. One such overlay is linked to the FHA Streamline Refinance. According to the official FHA guidelines, with an FHA Streamline Refinance, lenders are not required to verify income, employment or credit scores. Yet, many lenders choose to verify regardless. This is because the FHA penalizes banks for making too many “bad loans” and verifications can cut down on defaults. Another important overlay is linked to your credit score. The FHA rules state that it will insure home loans for which the borrower has a credit score of 500 or higher. Banks, however, are reluctant to make such loans. Buyers with credit scores of 500 are highly likely to default in the next 6 months, which would negatively affect a bank’s FHA default rate, leading to fines, penalties, and perhaps, termination from the FHA insurance program. Beginning in late-2011, most banks enforced a minimum credit score for FHA loans of 640. That minimum score has since been lowered. U.S. homebuyers can now get an FHA loan with credit scores of just 580. 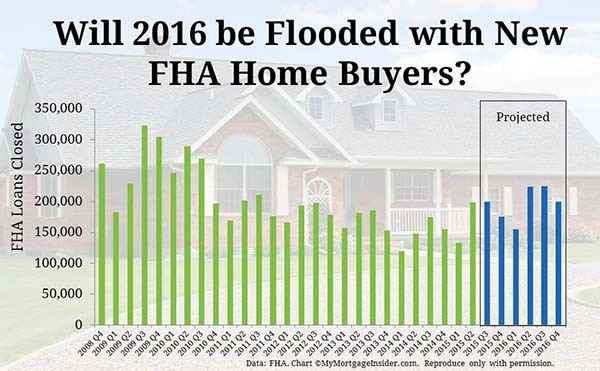 Furthermore, with the domestic economy improving and U.S. housing expanding, it’s not unexpected that minimum FHA FICOs would drop again soon. For today’s U.S. homebuyers, the Federal Housing Administration mortgage is among the most lenient and forgiving mortgage programs available. Find out whether you’re FHA-eligible.